Nestlé tries to achieve continuous improvement in its withdrawal, use and treatment of water Tweet This!, treating the water it uses as sustainably, responsibly and effectively as possible, protecting it through high-profile collaborations, educating communities in how to use water efficiently, and improving access to water and sanitation. This case study is based on the 2016 “Nestlé in society” report by Nestlé published on the Global Reporting Initiative Sustainability Disclosure Database that can be found at this link. Through all case studies we aim to demonstrate what CSR/ ESG/ sustainability reporting done responsibly means. Essentially, it means: a) identifying a company’s most important impacts on the environment, economy and society, and b) measuring, managing and changing. In its 2016 “Nestlé in society” report Nestlé identified a range of material issues, such as over- and under-nutrition, responsible marketing and influence, food and product safety, business ethics. Among these, improving water efficiency stands out as a key material issue for Nestlé. To identify and prioritise material topics Nestlé assessed the level of interest of its stakeholders in its material topics (including key stakeholders, opinion leaders and investors) through stakeholder convenings, independently commissioned key opinion leader research and investor engagement. 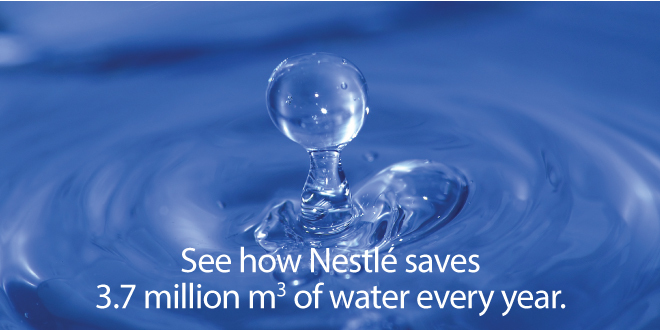 What actions were taken by Nestlé to improve water efficiency? Nestlé implements programmes to reduce water withdrawal, reuse water and use alternative sources. By the end of 2016, Nestlé had reduced water withdrawal by tonne of product in every product category, achieving an overall reduction of 25% versus 2010. In addition, Nestlé uses its Water Target Setting methodology to identify more reduction opportunities and, in 2016, assigned CHF 31.6 million to water-saving initiatives. Nestlé is currently applying 516 water-saving programmes across its factories, saving approximately 3.7 million m3 of water every year. Nestlé’s Water Resource Reviews (WRRs) aim to raise awareness at an operational level, identify risks and opportunities, and develop action plans for more sustainable water use. In 2016, Nestlé conducted 22 new WRRs in various locations, including Cuba, the USA, Vietnam and Switzerland. Nestlé has reviewed a total of 158 of its factories worldwide since the WRRs began, while Nestlé Waters completed WRRs at 100% of its facilities, and continues to work on improving its overall water use ratio (the amount of water required to produce one litre of bottled water). High-priority manufacturing facilities (HPMF) are sites located in areas of severe water stress or that represent an important portion of Nestlé’s annual water withdrawals. In 2016, Nestlé identified 24 such facilities and implemented water-saving projects at 21 of the 24 sites, saving 1.8 million m3 of water. The remaining three sites underwent a Corporate Water Target Setting audit in late 2016, which identified significant water saving projects for future implementation. Note to Nestlé: With each case study we send out an email requesting a comment on this case study. If you have not received such an email please contact us.